^ 1.0 1.1 巴西里约市议员及其司机在车中遭枪击身亡. 中国中央电视台. 2018-03-15 [2018-03-15]. ^ Press, Associated. 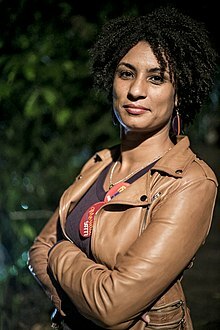 Marielle Franco, councillor and police critic, shot dead in targeted killing in Rio. the Guardian. 2018-03-15 [2018-03-15] （英语）. ^ Atos de protesto por Marielle Franco estão marcados em mais de 10 capitais. Justificando. 2018-03-15 [2018-03-15] （巴西葡萄牙语）. ^ Outrage over murder of Rio councillor. BBC News. 2018-03-15 [2018-03-15] （英国英语）.